As with most wartime cloth insignia tended to be in both embroidered and printed versions. According to surviving 52nd veterans the printed versions were mainly used on working dress and the embroidered versions were kept for their walking out or ‘best’ battledress. On the 7th January (1941) the brigade group was issued with the new divisional signs which came into use throughout the Army for wear on each shoulder by all ranks. In the case of the 31st Independent Brigade Group, a brigade group sign was worn. This sign was the family crest of Brigadier Smyth, the brigade group commander. Jan (1942) Divisional signs were now being worn. 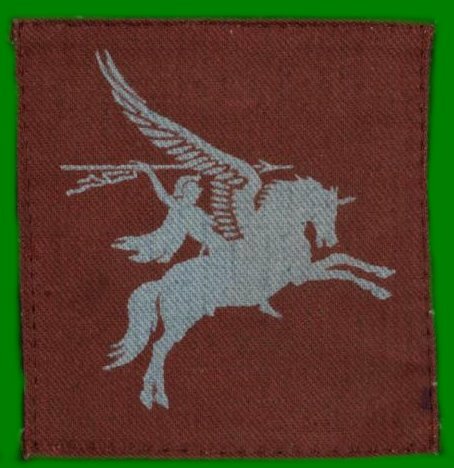 These were the after wards famous Pegasus (Bellerophon up) in pale blue on a maroon background and underneath the word“Airborne” in the same colours. Worn Approximately 1 inch below the Pegasus patches on both arms. This was the Airborne Forces equivelant of the “Arm Of Service” strips then being worn by the rest of the British Army. This item was ordered to be removed in November 1944, so by the time 6th Airborne Division deployed to the Ardennes in the winter of 1944/5 and Operation Varsity they were no longer being worn. Jan 1942 The Regiment was allowed to choose the style of regimental title to be worn on the shoulders in battledress. The title finally chosen was the word “Fifty-Second” in Regimental colours, which looked very well and was most popular with all ranks. 1942 In December (1942) the 52nd lost its “Fifty-Second” shoulder title. The powers-that-be had noticed it and pronounced it highly irregular. Be that as it may, its loss was felt keenly by all ranks and the title “Oxf. Bucks” which replaced it was not received with any enthusiasm. Printed OXF & BUCKS shoulder title along with the badges for Parachutist and Glider Infantry. Standard glider badge of British Airborne Forces with a Rifle Green backing of the same material as the cap badge backing. Approx ¼ of an inch should show framing the badge (Right arm approx 6 inches from the cuff edge). During May 1942 thirty-three officers and 400 other ranks had glider-flying experience, and twenty-two officers and twenty-eight non-commissioned officers practised map reading from the air in Tiger Moth aircraft. A glider badge, consisting of a small blue woven glider was instituted for wear on the right sleeve for all ranks who had completed three trips in a glider. Gliderborne Infantry could qualify as Army Parachutists, however they did not wear Parachutists wings (these were only worn by those on the strength of a Parachute unit). As their main method for being delivered into battle was the glider and not the parachute they wore a ‘Light Bulb’ (Badge consisting of a deployed parachute with no wings) instead. Period photographs show it being worn both above and below the glider qualification badge. The "Light bulb" could be backed in Rifle Green material in the same manner as the glider qualification badge. Photos exist of the badge being worn both with and without the green backing. volunteered and were sent on the course. These were not allowed to wear the normal para­chute badge, but were given a woven parachute badge without the normal wings to wear on the right sleeve of the battledress.